Good news, good news: we have some color this week! And she's back in my most favorite color for her, excellent. Interesting new addition to her court dress wardrobe, isn't it? 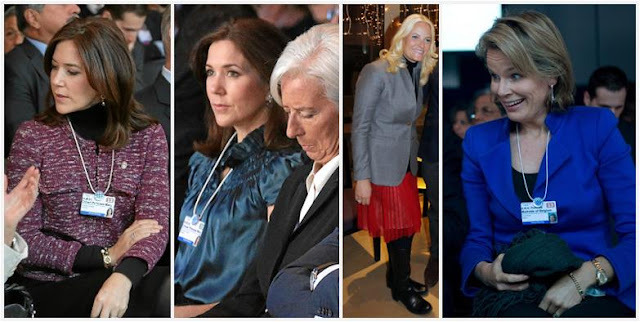 You can always find a handful of royals in Davos - these are just a few appearances. Seems everybody but Mette-Marit's floaty red skirt got the "No fashion! All business! For the peoples!" memo. I was with you until you stood up. Leave the high-waisted plaid trousers to the golf course, I think. Oh, so close - and we almost got through a whole week without my whining about blergh. Oh well. I'll allow it.